I am beaming with joy and excitement to finally make an exciting announcement!! I have been invited to be a GTD!! 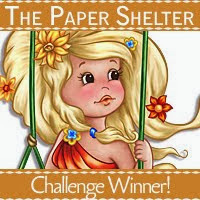 I am very thankful to be given this amazing opportunity to partake in guest designing in the following challenge blog http://7kidschallengeblog.blogspot.com/ . I want to give a huge shout out of thanks to www.7kidscollegefund.com for asking me to be a guest on the challenge blog! It was a blast trying to come up with something cute. Wow, I had forgotten just how much Christmas stuff I had collected throughout this past year. As I started going through some of my Christmas stash, I came across something that brought a smile to my face along with a bit of Christmas spirit and all the excitement of all the holiday festivities. 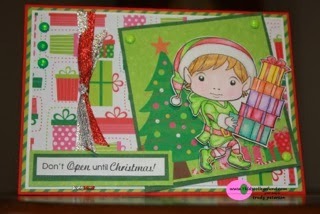 What a cute way to share with others the holiday spirits than to color up this cute pie La La Land Christmas Elf and put him on a holiday decorated card. Supplies used on this card are: Memento Tuxedo Black Ink, Christmas Elf Luka Stamp from La La Land Crafts, stamped message came from La La Land Crafts Christmas Luka, colored pencils, Doodlebug Design Inc's Sugar Coated Brads, red card stock and some various Christmas design papers, and silver and red metallic ribbons . Such a sweet card Trudy! Thanks so much for guest designing with us for our Anything Goes Challenge. The colors you chose are so pretty. Great card! Just love the festive colors! So glad you are guest designing with us at 7kids College Fund Challenge! Hope you are having fun!